The band Markey Blue was formed in Nashville when Ric Latina and Jeanette Markey teamed up as a duo for “a few club dates” and things began to click sspk8yd. Together they started writing songs and found their diverse backgrounds, Markey a Vegas showgirl, stand up comic and actress, while Latina’s impressive resume of studio and touring work for some of the top country stars out of Nashville, meant they weren’t your typical blues band. They’ve gone all-out, assembling the best musicians they could find but keeping the songwriting and production in their own pocket. 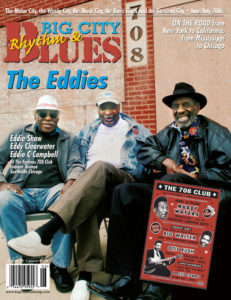 The results show in their second CD, “The Blues Are Knockin’” that they are ready to answer the call. Cutting through the ringing tambourine, delta Dobro and driving rhythm, Markey’s husky voice cries out “I’ll Wait For You” and picking up the pace, Lantina’s guitar takes the lead as Markey, her voice taking on the tone like Shawn Murphy, declares “That Ain’t Good Enough.” With a force like Etta James “Damn Your Eyes” the undercurrent of the B3, blare of horns and chilling guitar solo heats things up as Markey pleads it’s “Cold Outside.” Banking on a solid rhythm and B3, Markey tells it like it is declaring “Cash Is Always King” and the guitar pays out with interest. There’s no escaping when “The Blues Are Knockin’” with its slow wail of the guitar as Miss Blue’s sweet vocals take hold. “Be My Train” lets Latini’s playing pay tribute to Little Milton while Markey’s vocal on “Lay Down Lucille” with Ric’s licks make this a full-on B.B. King tribute. Showing the full power of Markey’s vocals, the message is tough and hard hitting, there’s no doubt this girl is “Nobody’s Fool.” With the fluid guitar lines against a quietly intense vocal, there is a heartfelt passion on “Me Missing You.” As the guitar wails, Ric returns to the licks of B.B. King for “Worries” as Markey lets her heart take the lead. With this second set of soulful sounds from the Markey Blue band once you hear “The Blues Are Knockin’” open up that door and let the blues begin.